We’ve had exciting few weeks here at ISO Quality Services! Friday 25th January was a national #FunAtWorkDay. To brighten up the long, dark January days the team decided to get together and play a game called Scrawl, a pictorial version of Chinese whispers. A game full of awful drawings and terrible guesses! The room was filled with laughter when the correct phrases were revealed. For example, the phrase ‘Octopus Yoga’ underwent a horrific change throughout the round and ended as “Germs under a magnifying glass”. We’re sure the whole city of Worcester heard how much fun we had! 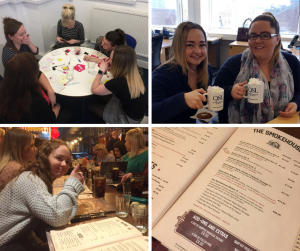 To warm up in the cold weather, on the 31st January the team took part in #NationalHotChocolateDay. Knighton Foods kindly donated a ton of hot chocolate powder to Midlands Air Ambulance Charity and businesses were encouraged to use it to raise funds. A fundraiser filled with hot chocolate was arranged in the office. Two kilos of hot chocolate powder meant the team had a tasty day! Hot chocolate, whipped cream, marshmallows and Training Director, Debbie Farr’s, homemade biscuits… What more can you ask for? We’re proud to announce our team and visitors raised £35. We are getting closer to reaching our annual fundraising target. As of 7th February 2019, we have raised over £3,100 for Midlands Air Ambulance. To celebrate January finally being over, last Friday our office team headed to Hickory’s Smokehouse for a well-deserved team lunch! Our bellies were filled with smoking hot specialties accompanied by Southern classic cocktails! A lovely afternoon spent in good company, what a perfect way to start the weekend! The team here at ISO Quality Services are like a one big family. We go for team meals together, arrange team-building days and have annual summer and Christmas parties! Not to forget everyone’s birthday celebrations in the office! Currently we are looking for a friendly, organised and chatty Client Services Account Manager to join our team. Read more here.